U.S. Senate election results map. Red denotes counties won by Kyl. Blue denotes those won by Coppersmith. 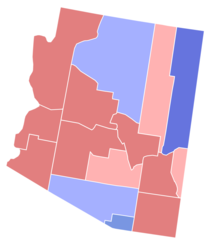 The 1994 United States Senate election in Arizona was held November 8, 1994. Incumbent Democratic U.S. Senator Dennis DeConcini decided to retire instead of seeking a fourth term. Republican nominee Jon Kyl won the open seat. ^ "94 CONGRESSIONAL ELECTION STATISTICS". clerk.house.gov. Retrieved 13 April 2018. This page was last edited on 25 December 2018, at 05:34 (UTC).